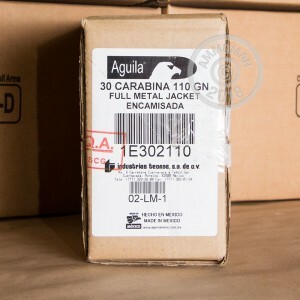 Finding ammo to keep your M1 carbine or Ruger Blackhawk fed just got easier thanks to this .30 Carbine load from Mexican brand Aguila ("Eagle") manufactured by Industria Tecnos. The Aguila plant is located in Cuernavaca and serves Mexican military and police needs in addition to exporting ammo all over the world. 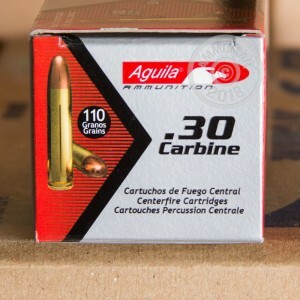 This 1,000 round case, which includes 20 boxes of 50 rounds each, offers excellent bulk savings for this hard to find cartridge. Each cartridge uses a 110 grain full metal jacket round as well as non-corrosive Boxer primers and reloadable brass cases. 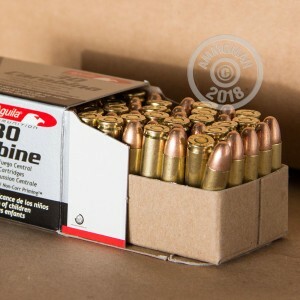 This bulk case of ammo comes with AmmoMan.com.com's free shipping offer for all orders over $99. The price quoted here is the price you pay.